Secret Service Chief Grilled Over White House Security Failures : The Two-Way Lawmakers on the House oversight committee ask Julia Pierson about the Sept. 19 "fence jumping" incident at the White House, as well as several other security concerns in recent years. 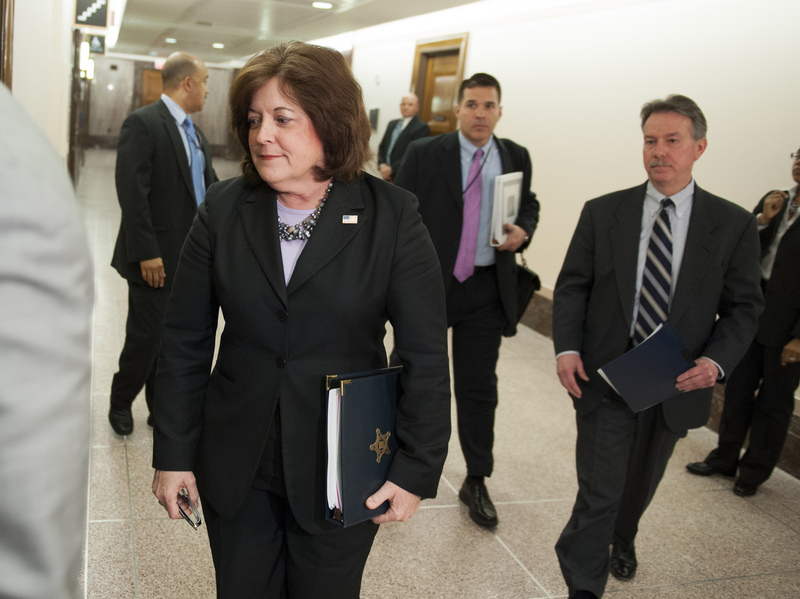 Secret Service director Julia Pierson enters a hearing room in April to answer questions before a closed meeting of the Senate homeland security committee in Washington. Today, Pierson will appear before a House committee to respond to questions about White House security breaches. Secret Service Director Julia Pierson faced a tough inquiry by lawmakers today as she appeared before a House committee to answer questions about the Sept. 19 White House security breach in which a man with a knife entered the executive mansion. "It's clear that our security plan was not executed properly. I take full responsibility. What happened is unacceptable and it will never happen again," Pierson told the House Oversight and Government Reform Committee in her opening remarks. She said she was committed to a full review and implementing recommended changes. NPR's Juana Summers says despite the hearing being held during a recess, there was a strong showing from lawmakers and an overflow crowd of spectators. Representatives were often combative and scolding in tone during the questioning. Pierson sat generally expressionless opposite committee members a day after reports from The Washington Post that after jumping the fence, Omar Gonzalez made it past the front doors, overpowered a guard and then ran across the East Room before being tackled at the doorway to the Green Room. Pierson told committee members that there had been 16 incidents of "fence jumping" at the White House in the past five years, including six so far this year. Rep. Darrell Issa (R-Calif.), the committee's chairman, called the breach "amazing and unacceptable." "An intruder walked in the front door of the White House. That is amazing — and unacceptable. Common sense tells us this was a significant security failure — not an instance of praiseworthy restraint," Issa said. "How on earth did it happen?" Issa asked. "This failure ... has tested the trust of the American people in the Secret Service, a trust we clearly depend on to protect the president." The ranking Democrat on the committee, Maryland Rep. Elijah Cummings, said what concerned him most was that "agents said they were hesitant to raise security concerns with their supervisors." Later, he asked about a report that a female agent was reluctant to bring concerns to her supervisors. "Does it trouble you that some of your agents apparently don't feel comfortable coming to you with concerns?" Cummings asked. Pierson said: "Yes it does." Pressed by Rep. Jason Chaffetz (R-Utah) on whether Secret Service officers who observed a person approaching the White House who did not appear to be armed were authorized to use lethal force, Pearson said that it was a matter for an "independent decision." She said she wanted officers to use appropriate force for anyone trying to breach the White House. Asked by District of Columbia Rep. Eleanor Holmes Norton if the sequester had an impact on Secret Service staffing, Pierson replied that the service was "down nearly 550 employees from our optimum level." White House spokesman Josh Earnest said Monday that the president and first family, who were not in the executive mansion at the time of the breach earlier this month, are "obviously concerned" about it, but have confidence in the Secret Service. While the fence jumper incident dominated the hearing, Pierson, who took over as Secret Service chief last year, also was questioned extensively about a 2011 incident in which shots were fired at the White House. "A bullet smashed a window on the second floor, just steps from the first family's formal living room. Another lodged in a window frame, and more pinged off the roof, sending bits of wood and concrete to the ground. At least seven bullets struck the upstairs residence of the White House, flying some 700 yards across the South Lawn. "President Obama and his wife were out of town on that evening of Nov. 11, 2011, but their younger daughter, Sasha, and Michelle Obama's mother, Marian Robinson, were inside, while older daughter Malia was expected back any moment from an outing with friends." The New York Times says a 2009 breach in which a couple crashed a state dinner, the drinking and prostitution scandals on overseas trips in 2012 and 2013, "and 16 separate cases of people scaling the White House fence in the last five years" would probably be subjects of the committee's inquiry as well. "According to a law enforcement official briefed on the current investigation, uniformed Secret Service officers at the White House failed to follow several of the agency's protocols. Although the protocols call for an officer to be standing outside the North Portico door, there was no officer there as Mr. Gonzalez made his way up the steps. The officer who was stationed inside the door failed to lock it after an alarm was sounded that someone had jumped over the fence, the official said."